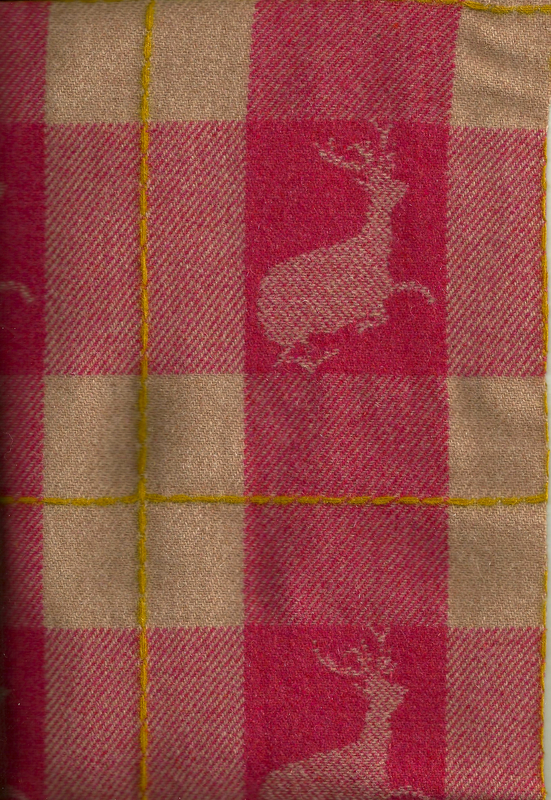 It is a moderately heavy-weight wool blend, made in Italy (the source of so many beautiful and exquisite fabrics), and its friendly jacquard-woven deer, set amongst the bold pink checks, with that subtle gold woolen thread traversing its expanse, seemed to be a blend of Tyrolean style, buffalo checks, and frontier whimsy! I loved it, but I could not quite imagine it made up into anything wearable – at least for me. So I decided not to buy it. What can I say? I had to have it. Of course, by the time I reversed my decision, I had determined it was the perfect fabric from which to make a small blanket – just the right size for a “wee one’s trundle bed.” The small trundle bed, which we purchased years ago, has been patiently waiting to be used by a wee one – and although our little granddaughter is still in a crib, it won’t be long until this little bed will be the perfect place for her to snuggle and sleep and dream when she is with us. 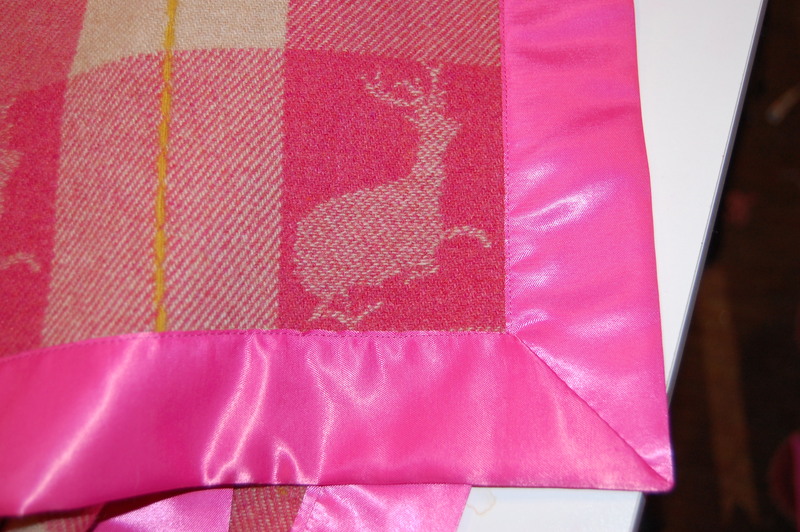 So of course – a warm, whimsical blanket was in order. 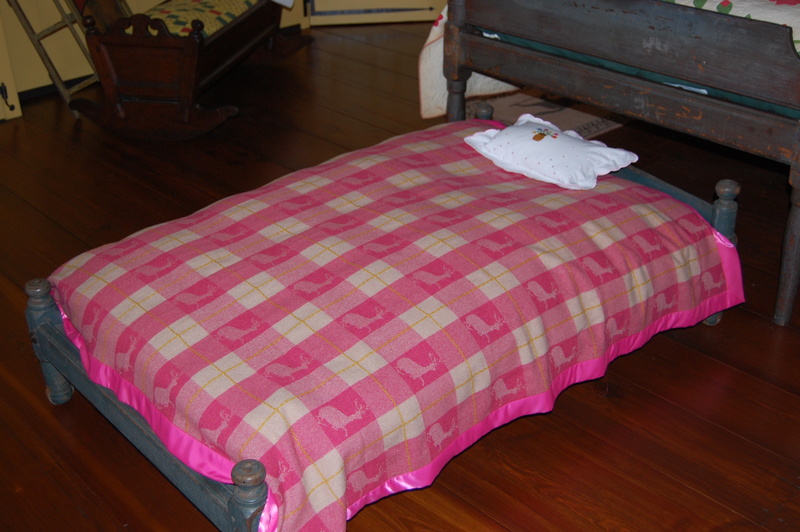 Since it is almost impossible to find linens to fit such specific little beds, making one was very much on my agenda. The first thing I did was go to JoAnn’s Fabrics to see if I could get blanket binding. I could not believe my eyes when I found this bright pink color. 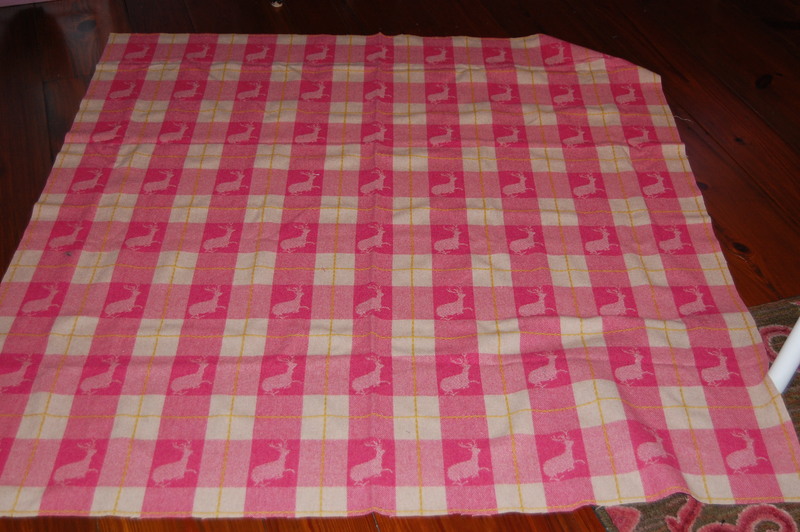 Then it was just a matter of measuring, deciding where in the plaid of the fabric to place the binding, and sew! 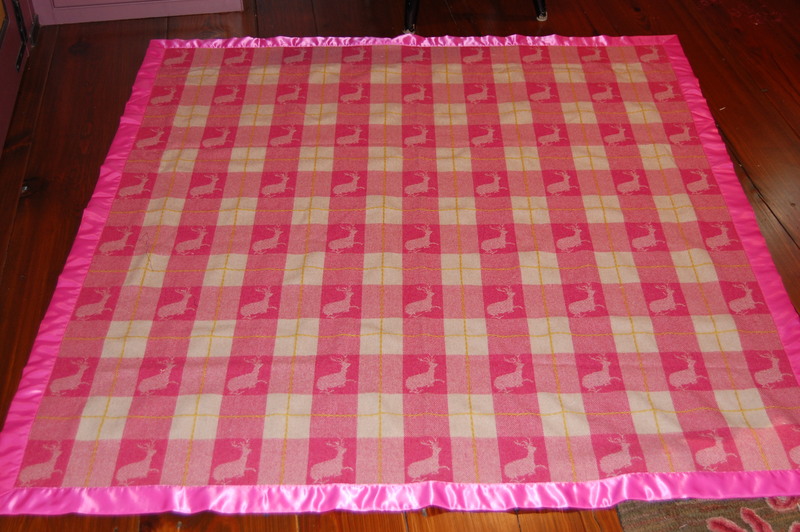 One thing that made the application of the satin blanket binding much easier was using a walking foot. Nice and easy and fun. Cut and ready to be bound. The binding sewn on, blanket finished! I mitered the corners and used a fell stitch to hand-finish them. It fits well . . .
. . . and is nice and warm. I had ordered a bit more fabric than I thought I might need – enough to make a doll blanket – and maybe a jacket for a teddy bear one day. Who knows – we’ll wait and see what our wee one asks me to sew. I fringed the edges of the doll blanket and added rick rack for fun! Too pretty to go completely out of sight – and easier to pull out for” wee ones”. Oh my goodness…Aida is going to be in heaven when she comes to visit! I can just imagine her tucking her dolls in for bed before she snuggles under your new blanket in the trundle bed! You are already such a fantastic grandmother, CoCo. We love you! There is no end to the fun that Aida and I are going to have!! Adore this fabric! You are a grandmother after my own heart! And she will be snuggling under that beautiful spread in her big-girl bed before you know it. 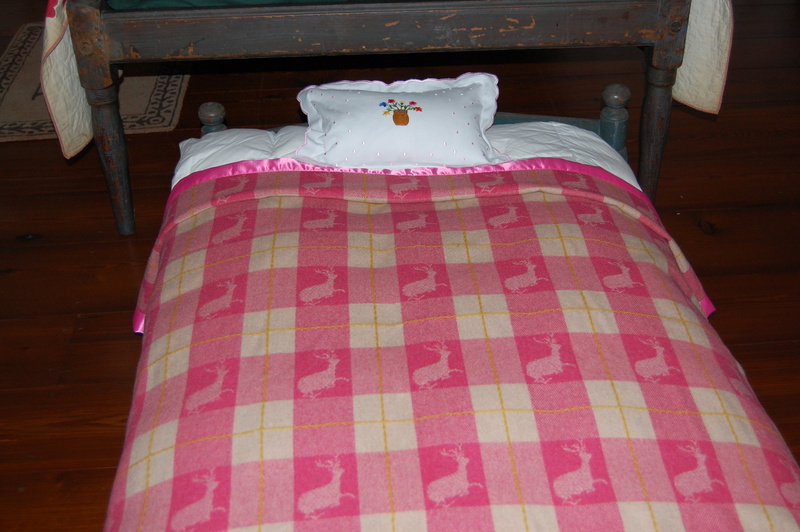 I have just replaced the pretty duvet cover I made for my granddaughters’ bed here with Thomas the Train sheets, straight from Wal-Mart, anxiously awaiting a visit from my 2 1/2 year old grandson. Boys are great — but girls are a lot more fun to sew for! Just wait til you start dressing her dolls — talk about addiction! Being a grandmother of a little girl is definitely a treat for those of us who sew! Obviously, I have just begun on this delightful journey, but I have many plans, including doll clothes! I love that fabric and what you did with it. 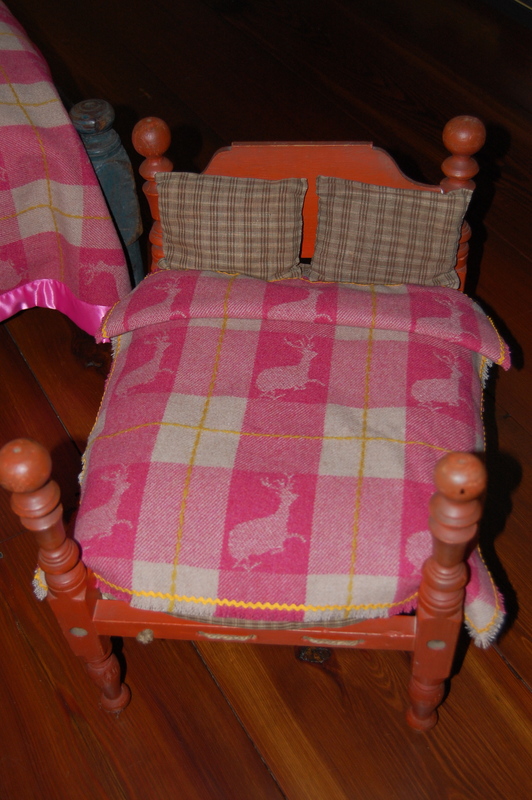 The doll’s bed is so adorable! Thanks, Lizzie! 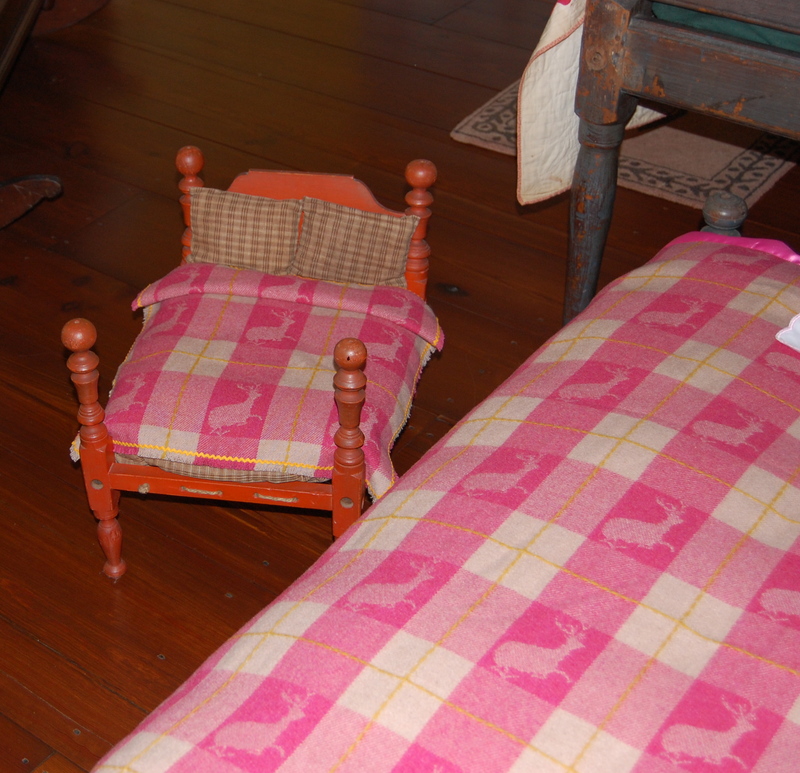 I have a real weakness for “little things” like doll beds, and what good is a bed without a blanket? So sweet! 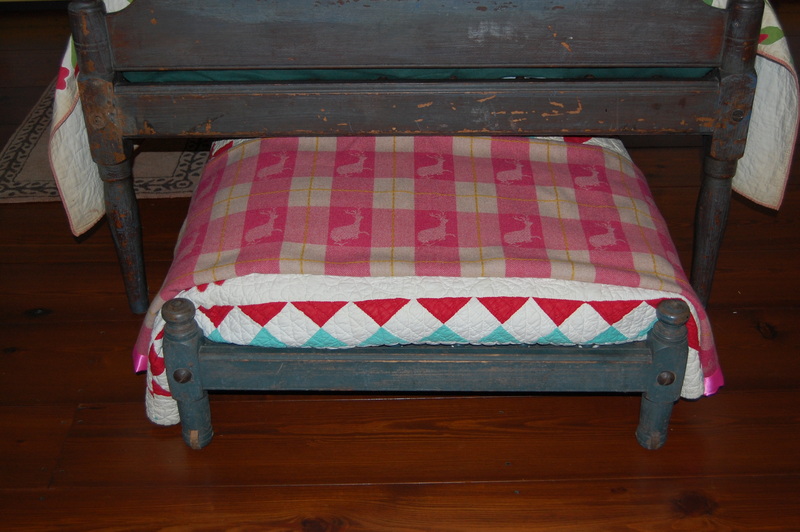 I love the rick rack trim on the doll blanket! And, of course, your mitered corners are beautiful! Thank you, Brooke! 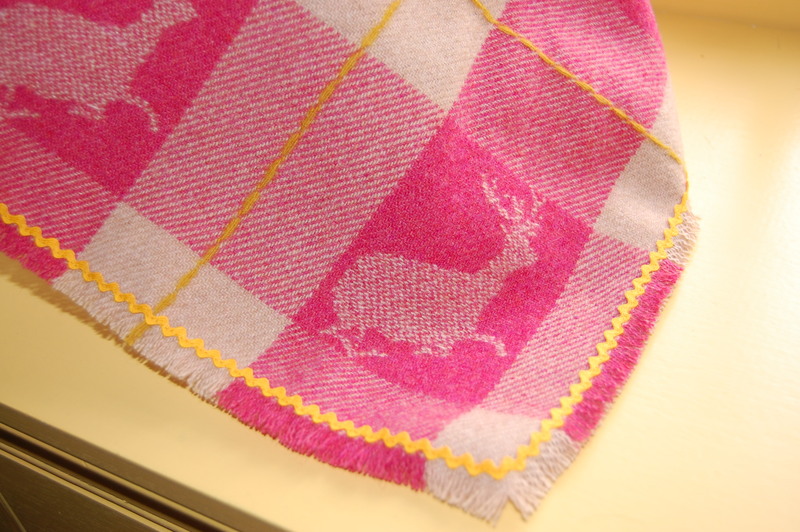 Rick rack is one of my favorite embellishments – and it seemed perfect for the little blanket! Oh. How. Darling. Is. This. Thanks, Joanne! It was lovely to make something so simple for a change!